This article provides instructions for installing the new version of the mobile app before it is publicly available in the Google Play store on November 28th. iOS users: Click here for installation instructions. 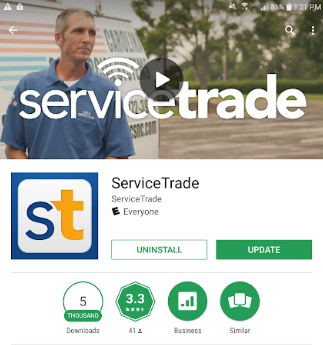 Open the Google Play Store, search for the ServiceTrade app, and view the app profile. Or, just click here to open the profile. 2. 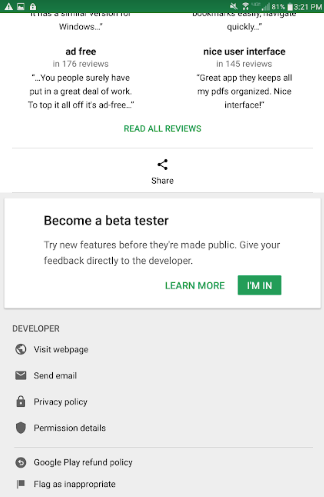 Scroll down the profile until you see a card that says "Become a beta tester" and select the "I'm in" button. 3. Select the "Join" option on the next popup. You will now see a message that reads "Beta signup in progress..."
4. If this message doesn't change after a few minutes, close and reopen the Google Play store and navigate back to the ServiceTrade app profile. You should see a green notification that reads "You're a beta tester for this app. Awesome!" Select the "Install" button to install the beta version of the ServiceTrade mobile app.